How Tolerant is a Gay, Black Lives Matter Racist? Juan Williams blamed gun loopholes. Criminal Hillary Clinton and White House Press Secretary Josh Earnest quickly jumped on the bandwagon to blame guns. The left blatantly disregards the fact that gun sales have been through the roof in Virginia for the past decade and gun crimes are way down. 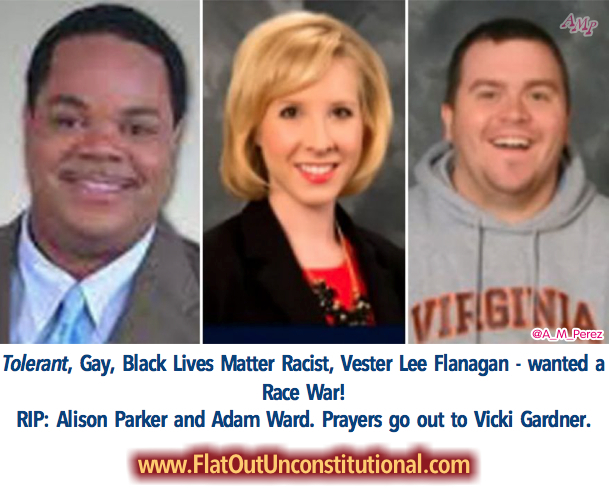 The one person that Juan, Hillary, Josh or any of the left will not blame is liberal whack job, Vester Lee Flanagan, AKA Bryce Williams after he shot and killed two reporters, Alison Parker and Adam Ward who were giving a live television broadcast. He also severely wounded Vicki Gardner, the woman being interviewed, by shooting her in the back. He filmed the whole thing and posted it on Twitter and Facebook. He was upset, because he claimed that Alison made a racist comment. Hours later, Vester did the world a favor by shooting himself while being pursued by police. He died after they got him to the hospital. 🔷 He says he has suffered racial discrimination, sexual harassment and bullying at work. 🔷 He says he has been attacked by black men and white females. 🔷 He talks about how he was attacked for being a gay, black man. Shouldn’t we be blaming and banning a flag or two now? Vester was a product of the racist Black Lives Matter movement and the Force Homosexuality Down Our Throats movement all wrapped in one. He was indeed a human powder keg, but one that was designed and created by the race baiting, homosexual pushing, divisive Obama Administration. Obviously, he was a very evil, gay, black man who could not tolerate the fact that others didn’t see eye to eye with his chosen lifestyle. Vester figured that he could take advantage of the racial divide that has been created by the left and particularly the Obama Administration to give him a violent outlet for his anger. 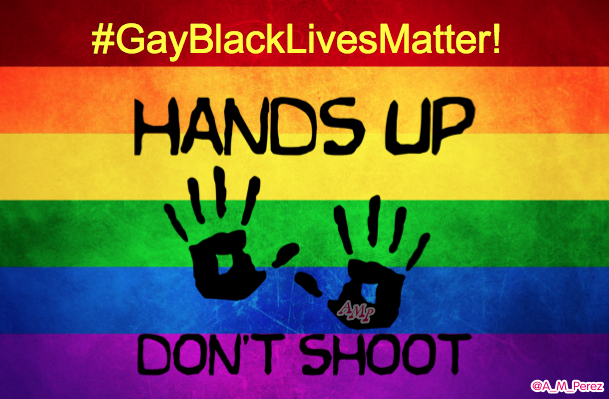 The Gays and the Black Lives Matter movements have a lot in common. They are both groups that are supported very strongly by the left wing for their ability to divide Americans. They are both filled with angry, bitter, and vile followers. They both resist the word of God. Their major difference is in how they pursue their goals. Gays use illegal, activist court decisions to throw out the will of the people and the Black Lives Matter savages use violence. When you wrap both up in one package and put a bow on it, you get Vester Lee Flanagan. The immediate reaction from the top levels of the left wing are to address Vester’s murders by attacking our 2nd Amendment rights. The left thrives on this sort of thing. They cannot let a crisis go to waste! A crisis gives them an opportunity to sway the populous who is in temporary shock, to give up our rights in the interest of safety. That safety never comes. It can’t be provided by those who promise it. You don’t see Obama standing on the soap box decrying the murders for what they are, evil and reprehensible actions of a Gay, Black Lives Matter, Racist. You don’t see Obama giving his condolences to the families of the victims, like he did for the families of thugs like Trayvon Martin and Mike Brown when they were put down. Vester is a hero to the left. He provides the kind of opportunity they salivate for. The crisis he enables is used as a fear tactic to scare We the People into submission. We must immediately put up our intellectual guards against the propaganda onslaught from the left that will ensue after this outrageous, cold blooded murder perpetrated by one of their own gay, racists. Vester is an example of why everyone should buy more guns, more self defense training, and more ammunition. While these types of violent attacks are actually extremely rare, in a nation of 320 million people they are still bound to happen occasionally. Left wing media hype about these events is on a sharp rise, because they want to beat the drum that we live in a violent society and that guns are to blame. Gun ownership across the country has been climbing fast over the last decade, especially among women and gun crime has been plummeting. Don’t be fooled by the tricksters in media who try to spin every bad story to garner support for more government tyranny. If you heed anything Hillary Clinton says, you have other problems that probably can’t be helped. The fact of the matter is, had Alison Parker, Adam Ward, or Vicki Gardner been armed, there would have been a better chance to stop the carnage at least a little sooner. You can’t avoid being ambushed, but you can stop an attack sooner and keep casualties lower if innocent, law abiding civilians are able to shoot back. Buy more guns. Follow your state and local laws, even if they are unconstitutional. Fight the battles to repeal unconstitutional gun control laws in your state legislatures and courts. In the mean time, abide by the laws you may be constricted by and get permits if you have to. Keep yourself armed at all times. Even if you have used guns for your entire life, it never hurts to get more defensive and safety training. It’s not expensive and it’s fun. You may never need your gun or your training. Chances are you never will, but it’s better to be safe than sorry. The Boy Scouts of America sum it up in two glorious words. Be Prepared! Previous The 14th Amendment Doesn’t Grant Citizenship to Babies of Illegal Aliens! Next Vote Now! 4th Republican Primary Poll!